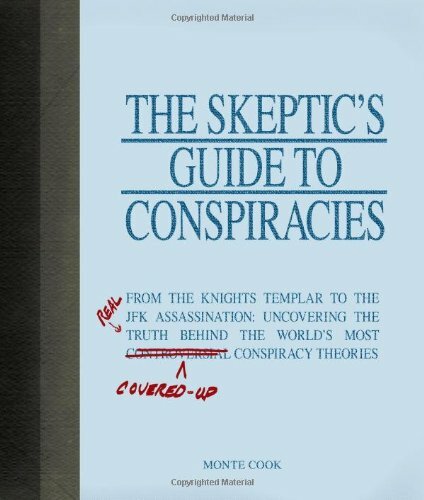 [PDF] The Skeptic's Guide to Conspiracies: From the Knights Templar to the JFK Assassination: Uncovering the [Real] Truth Behind the World's Most Controversial Conspiracy Theories | Free eBooks Download - EBOOKEE! Description: Did the noble order of the Knights Templar guard a secret about Jesusâ€™ birth? Was the moon landing faked in a Hollywood movie studio? Is the government keeping the remains of an alien spacecraft in the top-secret Area 51? Monte Cook takes a look at conspiracy theoriesâ€”ranging from the historically complex to the seriously whacked out. With a disbelieving eye, he traces the history of some of the world's weirdest ideas and even includes a chart showing readers how to make up conspiracy theories for themselves. Scattered through the book are the paranoid "notes" of an anonymous reader who claims to know what's really going on. You can make up your own mind as to who's telling the truth! No comments for "[PDF] The Skeptic's Guide to Conspiracies: From the Knights Templar to the JFK Assassination: Uncovering the [Real] Truth Behind the World's Most Controversial Conspiracy Theories".